A simulation drill to gauge local readiness for any emergency such as an armed attack will be held every year in a Macau casino resort. That is according to a Friday press release from the city’s gaming regulator, the Gaming Inspection and Coordination Bureau, a body also known by the acronym DICJ. The news was given following completion in the early hours of Friday of the city’s second-such simulation drill (pictured). 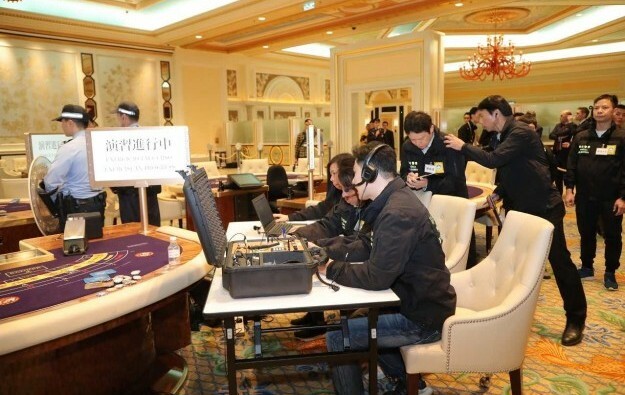 Emergency workers and other Macau government staff took part in the exercise, staged at the Venetian Macao casino resort, a property operated by Sands China Ltd. The government said the drill, code-named “Wolf Hunting”, had been designed to test the ability of public-sector departments and the local casino industry to coordinate and handle a response to major incidents. The simulation exercise was described as a success in press releases issued separately on Friday by the Unitary Police Service and the gaming bureau. The event simulated an armed robbery, with six ‘criminals’ attacking some patrons before escaping into a crowded hotel lobby. It involved simulation of multiple injuries, a bomb threat, people being held hostage and standoffs between the police and the ‘criminals’, said the Unitary Police Service press notice. Eight government departments participated in the drill, including the Unitary Police Service, the Judiciary Police, the Public Security Police Force and the DICJ. During the simulation exercise, the gaming bureau also tested the “Major Incidents Emergency Communication Mechanism”, which was established in 2017. The gaming regulator said in its Friday press release that the test achieved the expected results, adding that it was considered important to hold such large-scale contingency drills “annually”. “The DICJ will continue to assist the police in its simulation drills, as well as to coordinate the participation of the [gaming] concessionaires / sub-concessionaires in order to enhance the capacity to respond to unforeseen situations,” added the release. Friday’s exercise was the second major attack drill held for the Macau casino sector in fewer than 18 months. In January 2018, a similar exercise was conducted at Galaxy Macau, a casino resort owned and operated by Galaxy Entertainment Group Ltd. The venue is across the road from the Venetian Macao.